What is differentiated instruction and why do we differentiate? Elizabeth Breaux is a best-selling author and motivational speaker in the field of education. She is a former classroom teacher and curriculum coordinator. She currently works in the instructional service department for the Lafayette School System in South Louisiana, where she trains and supports new teachers and their mentors. Liz also trains assessors for the Louisiana Department of Education. In addition, Liz is an international presenter for the Bureau of Education and Research. Classroom Management—Simplified: Managing to Teach! Critical Thinking: How HOT (Higher Order Thinking) Is It? Handling the Challenging Situations: How Do They Do It? Liz has taught and worked with “at risk” students for the past twenty-five years and believes that there is no more challenging and rewarding job in the world. Liz believes in taking students from where they are and leading them toward where they need to be. She believes that a calm caring environment, innovative teaching strategies, and constant positive feedback are the keys to students’ success. Liz is the author of three best-sellers: “Classroom Management– Simplified”, “How to REACH and TEACH All Students–Simplified, and the co-author, with her sister Annette Breaux, of “Real Teachers, Real Challenges, Real Solutions”. 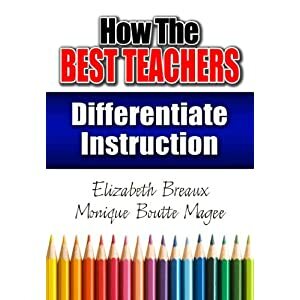 Liz’s most recent book, “How the Best Teachers Differentiate Instruction”, is now available. Monique Boutte Magee began her educational career teaching 3rd grade and left the classroom after seven years. Currently, she is an innovative, practical, “think-out-of-the-box” middle school administrator. She is currently the principal at Lafayette Middle School in Lafayette, LA, and has served as an administrator since 2002 in the public school system. Monique has worked with a variety of different students including French immersion, gifted, and low performing students. Monique has assisted her teachers in transitioning from the traditional methods of instructing to the differentiated, tech-savvy, modern age of teaching. She has equipped each classroom with top notched technology and students are able to engage in fun, meaningful lessons. She keeps abreast of the current trends and best practices in education to help her students and teachers excel. Monique is an analytical thinker and uses data-driven curriculum coupled with modern “new practices” in education to drive instruction. She has assisted her teachers in improving standardized test scores and the school’s annual yearly performance.